Can be used anywhere a roller/ball catch etc. would normally be fitted. The magnet will never wear out or demagnetise like standard magnets. No latch noise when opening and shutting door (unlike a roller/ball catch). Completely concealed when door closed, no unsightly protruding strike plate lip (unlike a roller/ball catch). Can be used to help keep problem doors shut (e.g. with weak door closers, electric strikes, weak roller mortice locks, double sliding doors). Quick and easy to install - No chiseling required. 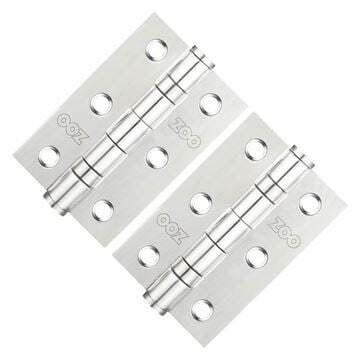 Supplied in quantities of 2 magnets, one for the frame side and one for door side to complete one door. Easyfit stainless steel housing cup automatically sets the magnets perfectly parallel to each other, essential for precise power adjustment. Power adjustment packers increase magnetic holding strength by inserting power adjustment packers (inside housing, under magnet) as required. (See picture 4). Lever on round rose in matt powder coated black.